I am always excited whenever I see the notification for a software update on my android phone. This is because OTA updates aims to improve and optimize various aspects of a smartphone. Good news for Infinix S2 Pro users. Android 7.0 OTA update is now available for your device. I made the statement below in a previous post. It is also a bit disappointing that it doesn't run Android 7 Nougat but Android 6 Marshmallow out of the box. 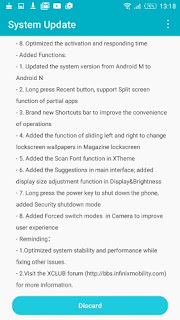 I Hope, Infinix Mobility will provide a Nougat Update soon. Yay! My wish came true. The Infinix S2 or Infinix X522 was officially launched in the Kenyan market a few weeks ago. The device was launched in Nigeria during Jumia Mobile week 2017. It shipped with Android 6.0 Marshmallow. 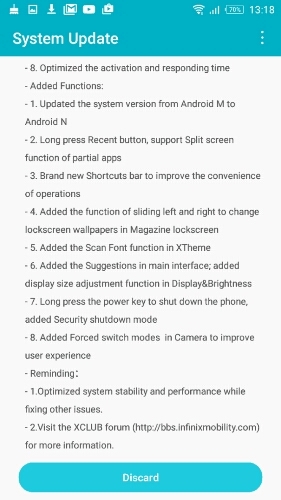 Infinix rectified this and started pushing OTA update to users. The firmware upgrade will update the X522 from Android 6.0 Marshmallow to Android 7.0 Nougat. The update will bring a lot of changes and enhancement to your device. Android Nougat has a lot of features such as Split screen multitasking, improved notification management, battery improvement and Doze on the go. You will get this goodies when you upgrade your device. Optimized interaction of fingerprint sensor to improve user experience. Optimized the visual sense and interaction of Magazine lock screen interface. Optimized the interface display of brand new Music 2.0. Optimized the file sending status display of XShare to improve the fluency of interface sliding. Optimized the multiple spots login experience of X Account. Optimized the interface display of Phone Manager, deeply clear trash. Optimized the interface layout of X Club. Optimized the activation and responding time. You should see a notification to download the Android 7.0 Nougat update as soon as it's available for your device. If you can't find it. Check if the update is available by going to your phone Settings > About phone > System Update. The OTA Update is about 1.8 GB in size so you should make sure you have enough data to download it. Preferably an unlimited Wi-Fi network. Once you've successfully downloaded the update, tap on install. The Infinix S2 Pro will automatically install the update and reboot your device after the installation is completed. You should see Android 7.0 Nougat on your phone. You will then be able to enjoy all the benefits of Android 7.0 Nougat. If, you want to buy the Infinix S2 Pro you can get it online at Jumia Nigeria. If, you have rooted your Infinix S2 Pro it is advisable for you to Unroot it first before installing the OTA update. If, you would like to copy the OTA update.zip file to a safe location, follow the guide below. If, you found the information in this article useful please share it with the share buttons below.